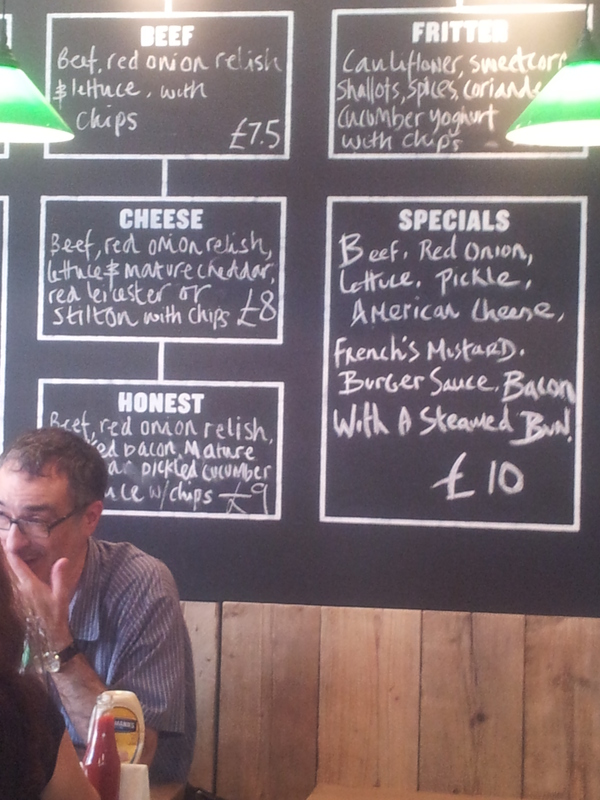 Burgers……Honest, Dirty, you name it we’ve got ’em. However to get in training I decided to try Honest Burgers, which recently opened their third branch in Camden Lock, (a fourth has now opened in Portobello and as I update post, another has just open in Market Place), a mere stone’s throw from where I work, so it would have been rude not to sample their wares. Right? I decided to trot down at lunchtime (for I am a piggy. Geddit? ), dodging tourists as I went – I was starving. It was rammed, but they also offer a takeaway service and there is the option of phoning your order in ahead (note to self for next time). I went for the cheeseburger, with mature cheddar, normally I’m a plastic cheese kinda girl, but this was lovely and not too strong. 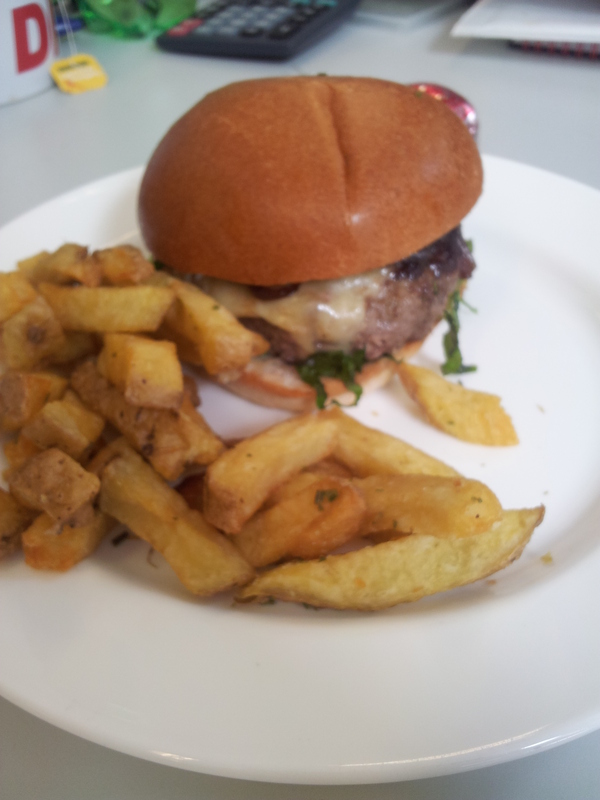 There is also the Honest Burger with bacon, or a special involving chorizo, manchego and chimichurri. The specials change regularly. All burgers come with chips (more of these later) and are in encased in a glossy, brioche-style toasted bun, with a generous helping of onion relish. I was close to gnawing my own arm off, so the 15 minute wait seemed like an eternity (it wasn’t). The service was charming and as I was packed off with added tomato ketchup and mayo, the waiter made sure that one flap of my box was open ‘otherwise it gets soggy’. Although I was just in a hurry to clamp my jaws around the bun, it was this attention to detail that made all the difference. Setting off at a brisk pace, and god help anyone in my way (I have been known to inhale a burger in under 5 mins**.) Back at the ranch, to my delight it was still juicy and plenty warm enough – and with no soggy chips. Oh GOD, I haven’t mentioned the CHIPS. Whatever is sprinkled on these fragrant, rosemary-salted babies, is the culinary equivalent of crack so addictive are they. They are both crunchy and fluffy at the same time (I’m drooling here). The burger was cooked nicely pink in the middle (and, thankfully, no Westminster food cops here). If you’ve got room for pudding (unlikely, but hey, go anyway! 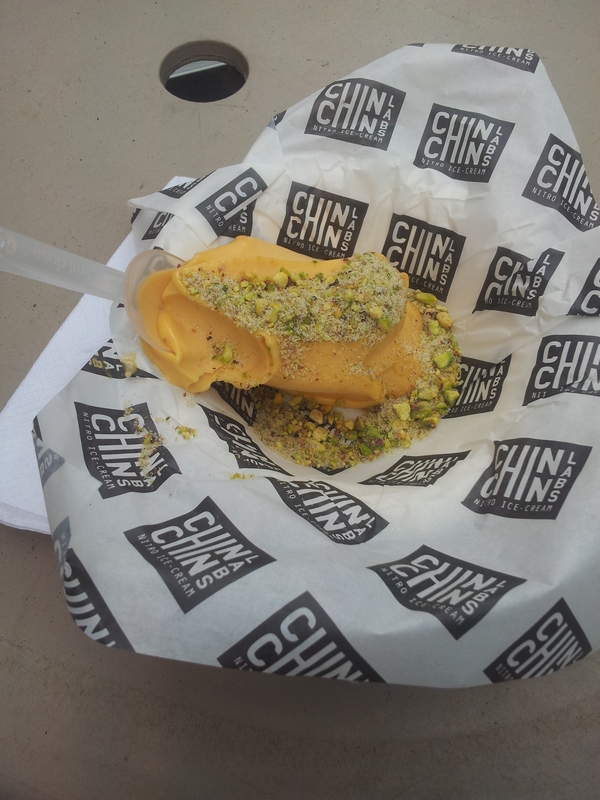 ), a few doors down from Honest Burgers are the marvellously inventive Chin Chin Labs, who make your ice cream to order in front of your eyes. Quite literally. All very Charlie and the Chocolate Factory. 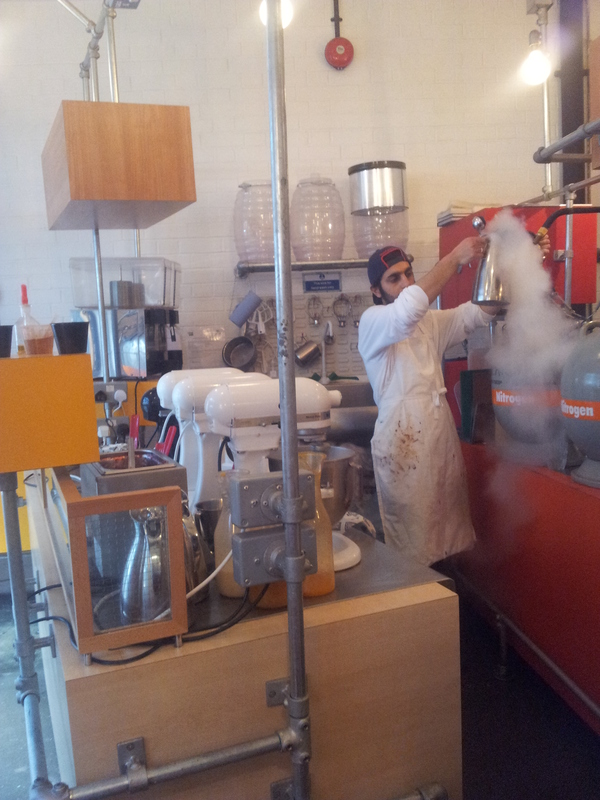 And here is my apricot and jasmine concoction. It was heavenly. They have ever changing special flavours. It’s fab. **As this goes to press I have heard on Twitter that we are not getting Dirty Burger, but Chicken Shop instead – still from the Nick Jones stable….and still tasty! UPDATE. 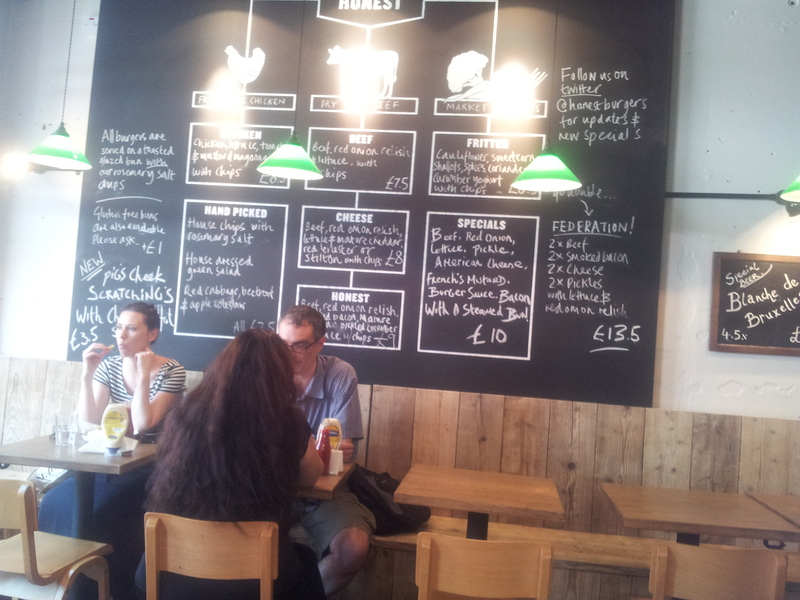 Latest news is that Tooting IS getting either Honest Burgers OR Dirty Burger. Rumours flying around on Twitter. Can anyone confirm?